We are having a sale to make way for some fresh merchandise! 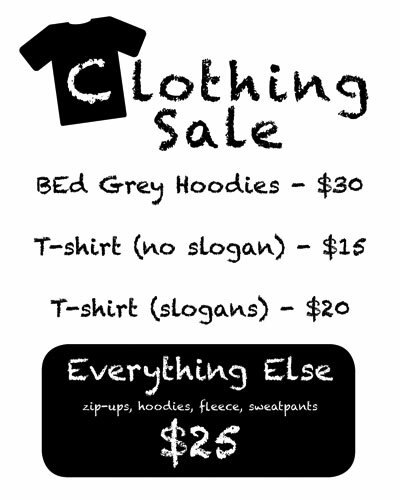 T-shirts, mugs, sweatpants, fleece.. everything is on sale and below cost! Please visit our office on Friday from 10am to 1pm to grab some cheap goodies before they run out! I am a elementary TC who is near the end of practicum, and would like to get my SA one of those “Don’t Make Me Use My Teacher Voice” T-shirts, if possible by this Friday. Is there any news about the T-shirts? Are they going to be available this week? can i order a pair of the grey sweats? Hello Susan, you should follow the contact information on this link: http://educationubc.wordpress.com/ if you need to order any ESA merchandise.